Carl Zeiss Jena, Werra 1e, 35mm viewfinder camera. Photograph gallery. 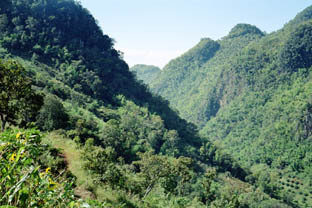 The Werra was treated to an epic five day motorcycle tour of Northern Thailand in December 2005, the so called "Golden Triangle". The Werra was lucky enough to spend most of the time bouncing around in it's bag sat on the passenger seat of the support jeep. It performed faultlessly and returned a whole roll of well exposed and perfectly acceptable images. The Tessar lens is on par with others of the breed but setting the aperture and shutter speed is a little fiddly, otherwise the camera is very pleasant to use. 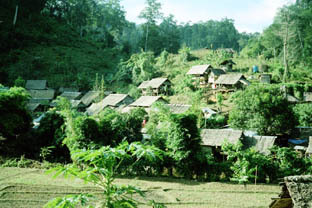 A tribal village nestling on a hillside near Mae Hong Son, home of the "Long Necks", so called because some of the women have their necks stretched with rings. I didn't photograph any with the Werra. In 2018 I decided to rescan some negatives for various cameras, as the internet is much faster these days. Although the films from this trip had been correctly stored, they had begun to deteriorate, as many do that have been processed in South East Asia. So here are a handful a bit larger than originally published. 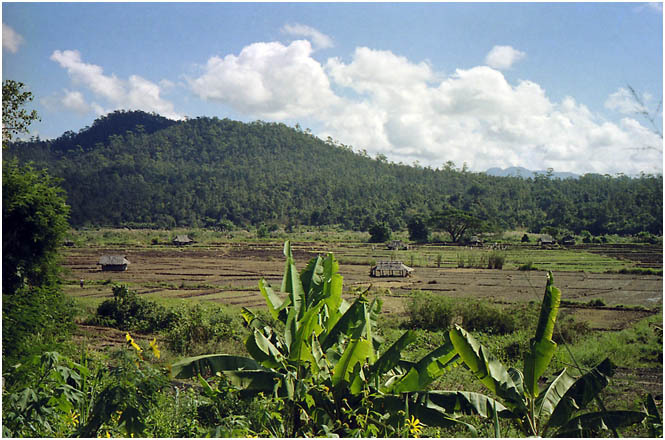 Much of Thailand is under agriculture of one sort or another, predominantly Rice Paddy. However most of our five day tour concerned exploring the hills and hairpin bends of the mountains. It was more about biking than photography, which tended to be reserved for rest periods. One site we visited was a museum which houses relics left over from the Japanese withdrawal from neighboring Burma during the closing stages of the second World War. 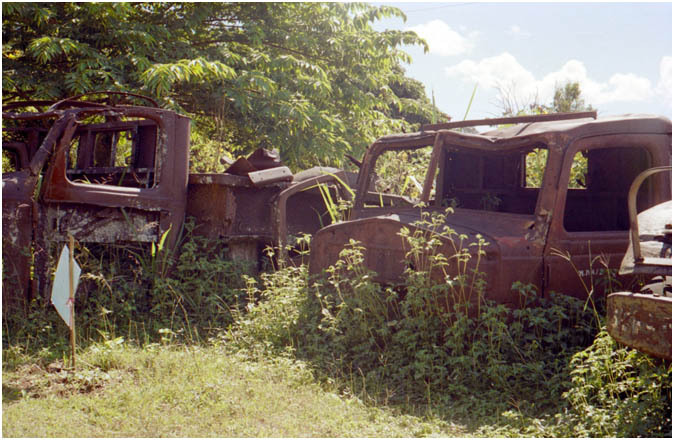 A shrine has been set up in the museum which houses many objects as well as these rusting vehicles left behind. 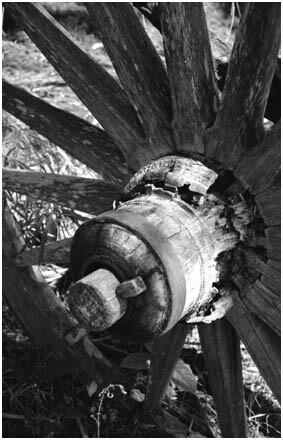 At right are the decaying remains of a cart, photographed for it's texture and testing the Werra's close up focus. It started out in colour, but some subjects are better in monochrome. "The back door to Burma"
Our tour took us close to the Myanmar (Ex Burma) border for much of the time. We explored three crossing points - although there are few you can actually use. This one is closed, but struck us as amusing as it is an old back door set into a bamboo fence. 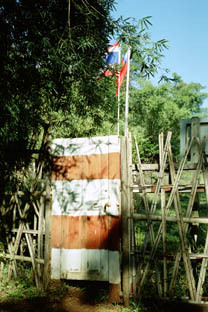 Beyond in "No mans land", the Thai and Myanmar flags flutter side by side. The trip, motorcycles, navigation, support jeep, food, entertainment and heaps of local knowledge were supplied by Asian Bike Tour. If you like riding motorcycles, you will love this trip! It beats the beach I tell you.